The ex-president will try on the role of presenter. He said on Facebook that the first episode of the talk show called "Different Ukraine" was recorded on the ZIK TV channel on 27 March. "We have recorded the first episode of the "Different Ukraine" on ZIK, and it came out fairly pungent. 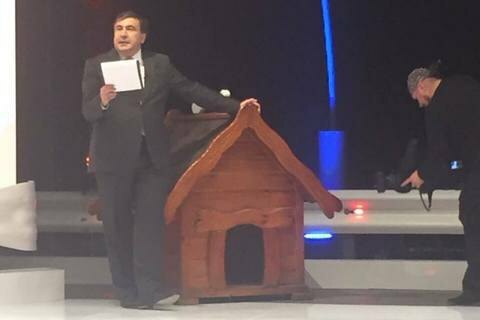 Every week during this show I will show you a country as it is not seen on any other channel," Saakashvili wrote. Judging by the photos posted by the politician, the guests of the show were people's deputies Volodymyr Parasyuk, Oleksandr Bryhynets and Serhiy Shakhov, as well as ex-Minister of Housing and Utility Services Oleksiy Kucherenko and former Energy Minister Ivan Plachkov. After the resignation as head of the Odesa regional administration, Saakashvili became a staunch opponent of President Petro Poroshenko. At the same time, he complained about the "information blockade" on the part of the authorities. London court sees no political pressure in "Yanukovych's credit"